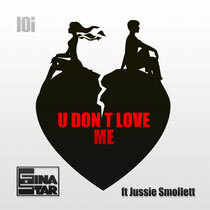 Gina Star finishes a top 2012 with releases on Toolroom, CR2, Big Beat, and now new label LOI as the LA-based Gina hits out with a new progressive house track, ‘U Don't Love Me’, featuring the voice of Jussie Smollett. Following up her remix of Tiesto & Mark Knight's ‘Beautiful World’, this vocal number loops Smollett's voice, along with huge synths and a drop that should be good for clubs and dance radio. As well as supplying the vocals, Jussie is also an actor well known for the hit TV show On Our Own, and you should be seeing him in a big TV role in the New Year. Gina says: "Every time I drop this track, the crowd sings it back to me like they've known it for years, which is a great sign seeing as it’s the first time they've heard it!" It's out now.